The mission : to ensure HSE (Health, Safety, and Environmental) requirements are met for the transfer of cargo to port or offshore on behalf of the cargo owner, the terminal, or a ship owner, in order to avoid all material, human, and environmental harm. The challenge : to protect your interests. Indeed, covering these HSE requirements is a duty. Should an incident occur, (accident, pollution…), this may lead to criminal prosecution and severe financial losses. 4SA’s commitments : we are fully aware of the level of responsibility involved and for this reason, we entrust the assignment to experienced HSE officers with a background in the merchant navy, who are trained by us in safety procedures. We were the first company to formalise these procedures from A to Z. At 4SA, these officers are referred to as TSOs (Terminal Safety Officers). The results : in 10 years, serious potential or actual risks have fallen from 23 to 2 per month, in our areas of operation (Lien courbe). 4SA’s TSOs, who represent you in the field, work on concurrent assignments, throughout the entire stay of a ship in port, in order to anticipate any accidents and incidents (intoxication, explosion, pollution…). With perfect knowledge of business and shipping terminology in English, the TSOs take on the responsibilities required of them by ship-shore safety agreements. Their expertise allows them to be a proactive force when dealing with the representatives of the terminal and of the ship. They regularly and thoroughly check all items on the SSSCL check list (Ship Shore Safety Check-list), ensuring you the highest level of safety. Should there be any non-conformance with safety standards, the TSOs can immediately stop an operation, until, with their assistance, on-site safety has been restored. 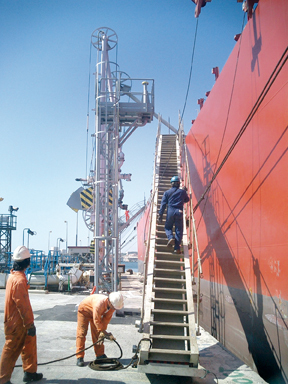 They correct non-critical mistakes (watertight door not correctly closed, hose out of position, gangway too steep, drip-leaks) and if required, they put into place preventative and corrective action for the medium and long term. In addition, 4SA saves a record of your operation (database and archive). BP Lavera then PETROINEOS since 2002, Trapil (NATO) since 2006, BP France since 2007, Géogaz since 2009, Total Petrochemicals since 2010, DPF since 2011, EDF-TL since 2011.